The Fred. 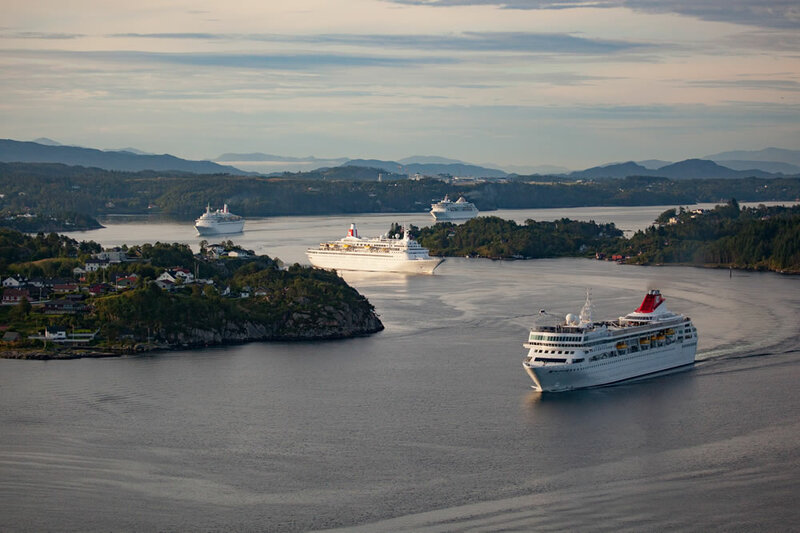 Olsen Cruise Lines fleet of Balmoral, Braemar, Boudicca and Black Watch all converged in Bergen, Norway, last week for the first time in history. Around 4,000 passengers on board the four vessels witnessed the ships enter Bergen harbour in formation at just before 8.00 am. Flagship Balmoral was berthed at Bontelabo Pier, sister ships Boudicca and Black Watch at Skolten Pier and Braemar at Festningskaien Pier, nearest to the city centre. This historic ‘4 Bs in Bergen’ event included a number of festivities on the day. A Norwegian-themed marching band performed on the quayside and guests were welcomed to Bergen by locals in national costume. An inter-ship ‘Tug of War’ took place at Festningskaien Pier. A city Treasure Hunt was also offered where guests were tasked with finding six historical locations. On-board entertainment included a lively Country Fayre with games, live bands and deck parties. Guests enjoyed complimentary drinks and specially-created Norwegian dishes, such as homemade gravadlax ‎and cloudberry pie. Guests were also entertained by opera singer Anthony Stewart-Lloyd, who performed a show on each ship‎. Guests also had the chance to visit all four ships as they were berthed along the quayside‎, and were invited to enjoy the different range of activities taking place across the fleet. A range of specially-themed ‘4 Bs in Bergen’ shore excursions were offered to guests, including a walking tour, a helicopter tour to see all four ships from above, and a Mount Fløyen funicular tour‎. The four ships departed from Bergen in convoy at 6pm, and exited the harbour in a ‘diamond’ formation, led by a fire tug boat ceremoniously spraying its water cannons.